To understand some of the complexities, complications, and confusions within the life of just one member of a community is to gain insights into the collective community. So I am a physical body and an emotional and (or spiritual) being. The two together make me I Am. Being a person means that I have virtues and flaws, gifts and needs, possibilities and defeats. Being a person means that I am like all other persons in the community, but also unique. This is a community which is a collection of people who have become aware of a problem and a broad goal, who have gone through a process of learning about themselves and about their environment, and have formulated a group objective. There is also an external creation of identity, formed by someone else within the community. These are the pictures that other people have of ‘me’ of who I am. The answer to the question ‘Who or what am I?’ becomes a matter of who is answering it. I am a kaleidoscope of feelings, thoughts, beliefs and desires with which only I am directly acquainted, and as social role community– relatedness to other human beings. This means that I am a self plus a story. The situation is comparable to that of a book. Books have similar physical elements, like paper, binding, and ink. What makes them unique is the story that they contain. Finally, I Am Rockford is an assembly of people that take pride in their city and have a desire to advance the future, together. 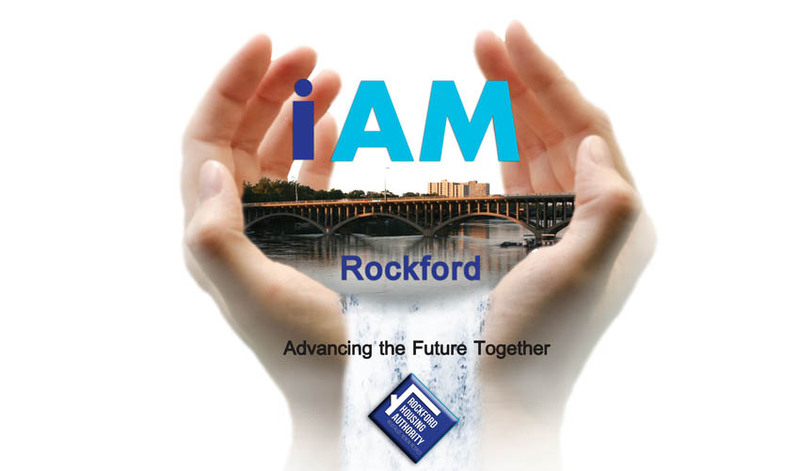 I Am Rockford is a branded alignment for community unity and solidarity designed to spark constructive dialogue on sensitive issues facing individuals who comprise the community of Rockford. The notion of community is dynamic and diverse in every aspect: class, religion, age, gender, language, and ethnicity. Thus, the concept of I Am Rockford is a community living, breathing organism signified by the words ‘human being’. There are some critical and rather basic factors to community. I am a physical being over time relating to my community and to others: I am a body. Through my body, I move through this community, I touch, I see, I hear, I taste and I smell. However, there is another aspect of me not directly visible or definable. This is the aspect of me which thinks and feels, reflects and judges, remembers and anticipates. Words used to describe this aspect include ‘mind’, ‘spirit’, ‘heart’, ‘soul’, ‘awareness’ and ‘consciousness’. This part of me is aware that I can never be fully known or understood by myself or by others in the community.